I recently got into a conversation with my coworkers about whether or not peanut butter is considered a food. It started when I declared it as one of my favorites, and someone said “peanut butter isn’t a food — it’s a condiment.” I guess I can see that being true, unless you’re one of those “I-eat-peanut-butter-straight-out-of-the-jar” types like I am. In which case, it’s clearly a food. However you classify peanut butter, its sweet and saltiness makes it one of my favorite things. I still eat peanut butter and jelly sandwiches for lunch on a regular basis, and chocolate peanut butter is one of my all-time favorite flavor combinations. I prefer my peanut butter of the natural variety (no added sugar, please) and the crunchier, the better. I came up with this recipe one morning while trying to decide what to eat for breakfast. I love the way peanut butter melts on hot toast, so I decided to crank it up a bit by making it a sandwich and cooking it up french toast style. The ooey gooey peanut butter and honey center is seriously awesome with the egg, toasty crunch of the bread. The banana is also a nice touch, but I’ll be honest — I added it to make me feel less guilty about the whole thing. And guess what? It worked. I think we’ve got another winner to add to my peanut butter recipe arsenal. When it comes to peanut butter, are you chunky all the way or does smooth make you groove? Preheat a large non-stick skillet over medium heat. 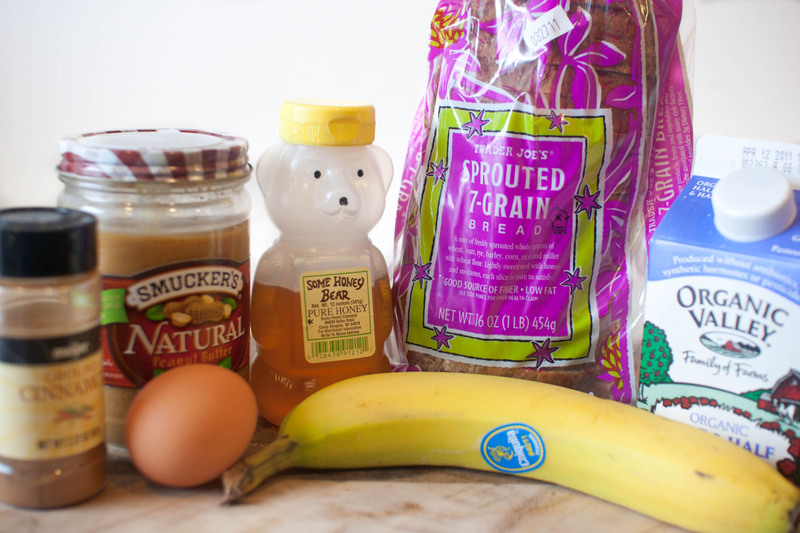 Make a sandwich as you normally would, layering peanut butter, banana and honey between the slices of bread. Meanwhile, in a shallow bowl, mix the egg, half and half and cinnamon. Dunk the sandwich in the egg, flipping over to saturate both pieces of the bread. Add the sandwich to the skillet and cook for approximately 2 minutes per side or until bread is browned, the egg mixture is cooked and the peanut butter is melty. 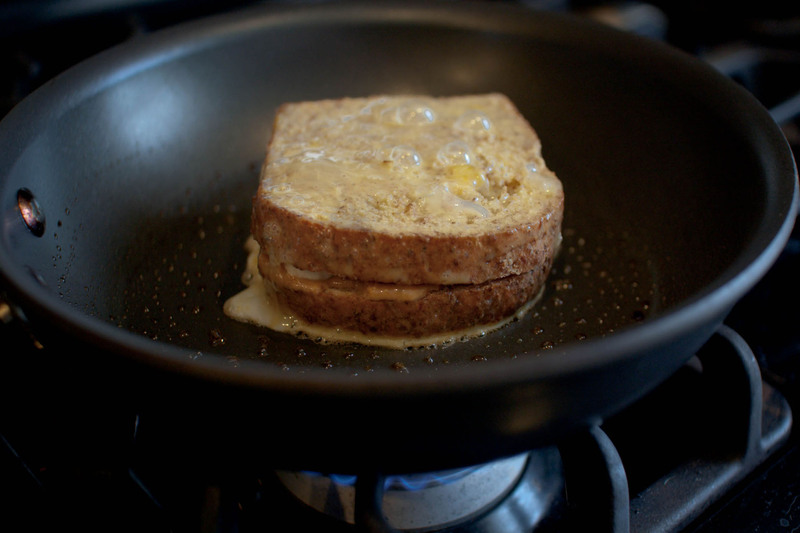 If you really want to indulge, add some butter to the pan before cooking the sandwich. Serve sandwich with a side of maple syrup and topped with powdered sugar, if desired. You can make this for me for breakfast anytime. These look so great! I’m trying to come up with an excuse to have brunch to make them (not that I need an excuse because I love brunch). Add some nutella and I’m sold!! Oh, believe me — I nearly went there! Have I said this before? You and I are total peanut butter twins! Chocolate and peanut butter, a fave combo. Definitely do the natural and super crunchy. Melted on toast, delish. One of my fave snacks as a kid (and still is when I can get away with it) is a peanut butter spoon…stick my spoon straight into the jar and go to town! Your french toast idea looks great!! This looks like a filling and healthy breakfast, I love it! And peanut butter is totally a food! Beautiful, healthy and delicious!!! Can’t beat that!! Peanut butter is not only a food, it’s a whole darn food group, in my opinion! Love the idea of sandwiching it between french toast. I love bananas and peanut butter sandwiches, but this takes it to a whole new level. Thanks for sharing! This is my idea of heaven!! I love how the PB gets all melty!! Mmmm! And with bananas and honey even! 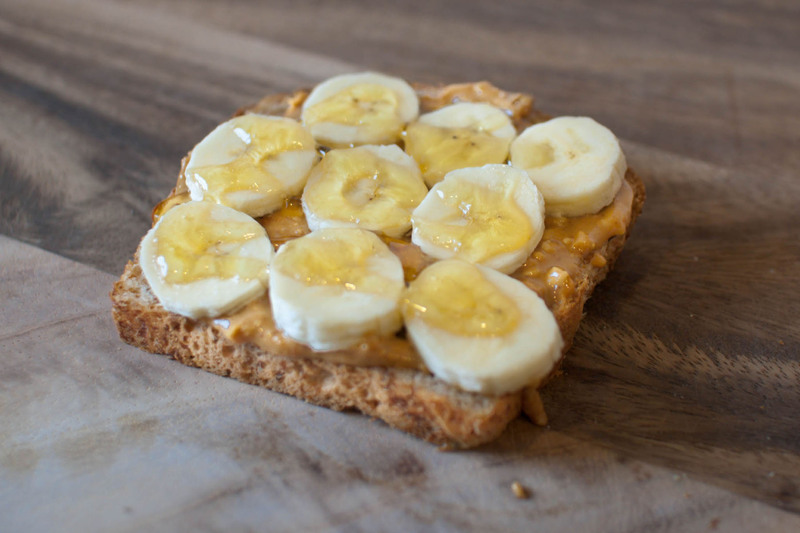 Yum – peanut butter and banana is such a great combination. Looks delicious! Oh yes, I could eat that any time of the day… sounds crazy good!! Psssh (if that sound can be translated to letters). Peanut butter is totally a food. Healthy and delicious. I often stray from peanut butter for a while after a binge but come right back to it in full force again later. Recently Ive been on a pb&j kick. 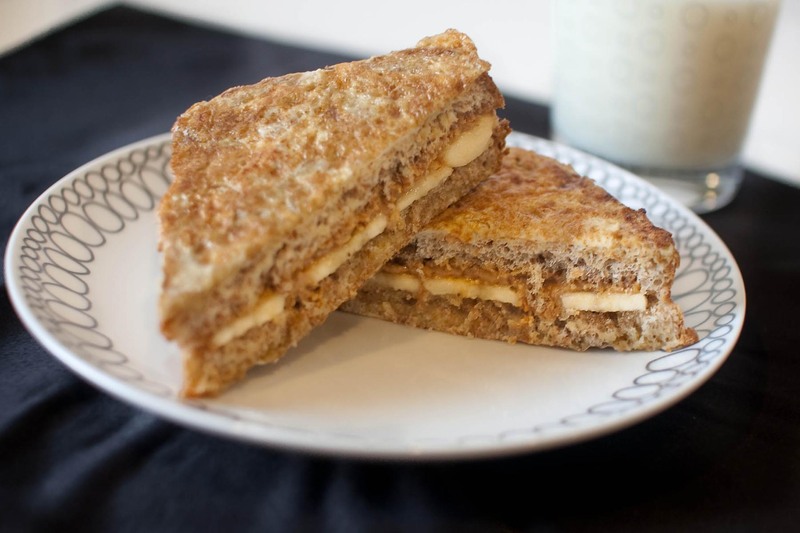 Love the idea of the french toast sandwich. Melty PB is the best! Do you deliver international to Mexico? I would love one of these for breakfast, straight away, please! 😛 I’ve had a serious crush for peanut butter that has only escalated in recent years. Goodness, this sammie looks darn delicious! I do live in Memphis, so there is a slight bias to Elvis on this one… but seriously, this is one of my favorite things to make! Delish.